Our mission is to provide the highest quality compassionate service to our families. Our values, Caring, Commitment, Integrity, and Quality, Dependable Service, guide the way we operate. Our vision is to be a source of education, information, and support for the bereaved in our community. We are committed to the quality of life around us, as individuals and as a family-owned funeral home. We are proud to be a Fremont family-owned funeral home for over 75 years. Please click on the links below to learn more about the various options. 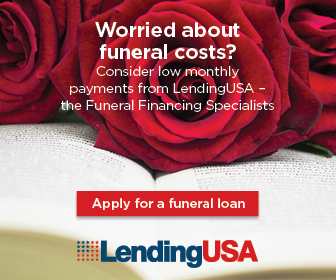 We are currently working with Lending USA to assist families in receiving financing for loved one’s funeral. You may click on the image below to start the process.